You pay quite a premium for Milwaukee. Too bad they don't test their tools. I have used this right angle drill attachment with suprizing results. It feels sturdy and the adjustable arm is a great addition for leverage. Works well for around the home projects. I really like the idea of its design for use with speed bits. Great product. I would recommend this to anyone. I used this for drilling holes in studs to run pipe/cable/wiring. It works great, and allows you to use your drill instead of getting a specialized right angle drill. Built very well. Be sure to wear safety glasses/gloves, since you are drilling at a different angle. The product worked well enough as a right angle drill attachment, but I had a tough time rotating the handle around. You have to loosen it and then rotate it all the way up towards the top before you can reposition it, and I found it very difficult to do. The handle kept sticking as I repositioned it when it should have turned smoothly. Depending on the postition I needed, it was quite annoying. I was excited when I first saw this product, but my excitement soon turned into disappointment. It looks well built, but my first one lasted about 10 minutes. When I tried to get a replacement, I was told that it was considered a consumable. I then made the mistake of buying another one thinking that the other one breaking was a fluke. Unfortunately, the second one lasted only about 15 minutes. Save your money! This is a beautiful little gem. It allowed me to make a repair on my car when my standard drill would not. The 2 inch bend is smaller than anything else I found. For as often as I need a right angle drill, it beats spending $200 on one. Those who had bits fall out need to learn to look at directions before giving scathing reviews. The chuck is magnetic, but you also have to pull back on the brass collar to secure the bit. 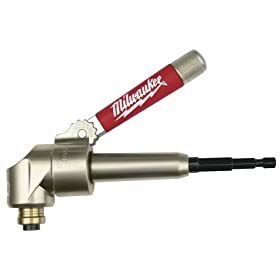 I remember needing one of these so long ago and my only option at the time was to get the skewdriver kit witch had a right angle adapter in it, but that was a much lighter duty version than this (of course i learned later that Milwaukee mad the same thing. So having gone through at least three of those i kept thinking that they should make a heavier duty one and they did. I have used this and it's one of those tools that i can't do without. This fine piece of eqpt.came in handy the day I rcv'd it..It's a great compliment to my 6pc. "Milescraft 2300 Wood Stubby Drill Bit Set"..I have no reason to doubt ordering this item was a smart purchase! Nicely designed, rock solid right angle adapter. Built with high quality heavy duty castings. Fits comfortably in the hand and the swing arm can be adjusted to apply pressure in any direction. One of most compact designs I've seen. highly recommended. This is the best right angle drill attachment on the market. It gets into tight places. You'll have to buy a chuck if you want to use regular drill bits. Or buy the quick release drill bits. I do not know how I got this far without this attachment. I do a lot of boat work with cramped spaces and odd angles that make it difficult to place a drill in anywhere near the correct position. This Right Angle attachment has a very small angle space and works beautifully. The adjustable handle is a great, great plus to apply pressure (which you virtually always need). Previously we used a no-name brand right angle attachment for our drill or die grinder. It was flimsy and bulky. 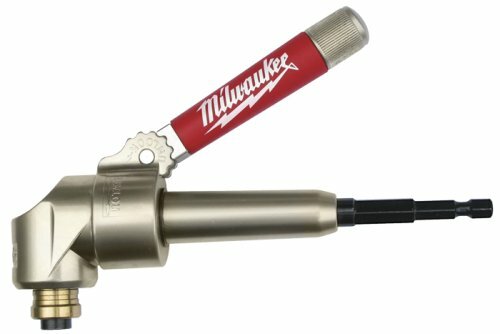 The Milwaukee unit is compact, well engineered and performs beyond our expectations. The swing-out torque handle makes it easy to drill into tight places with precision and reliability. Definately worth every penny. Way way way too much bit wobble !!! Useful tool solves otherwise impossible problems. This tool is one of those that you pick up and say to yourself, "Pretty neat. Nicely made. But how useful is it, really?" Truthfully, for most folks it will just sit in a toolbox and gather dust--until that once-in-a-while, ah-ha moment when you are puzzling out how to get a job done when the drill plus bit are too long to fit. At that moment, you will take this tool out, dust it off, and say, "My, I hope this works!" It's a Milwaukee, so it works, after you figure out how to adjust its handle and hold it. Most folks also have to figure out how to hold their mouth as they operate its chuck (which is easy, but different). After the job is done, you realize that this attachment just saved your bacon. This is one tool for which it is important to read the instructions (very short). The instruction sheet gives the following specs and warnings: The chuck takes 1/4 inch quick-release hex shanks: "twist bits to 1/8 inch diameter, flat boring bits to 1 inch diameter, and screw driver bits." "Be prepared for high torque situations that may cause the power tool to spin, causing loss of control." Imagine the tool spinning like a flag at a high rate of speed round and round the drill bit that is now acting as a flagpole. I can attest that my unit has seen larger twist bits than specified. However, don't use them until you know how the torque works. It can be very surprising, and it can destroy the tool and hurt you. If you need a right-angle drill to shoot holes in studs or joists, this is not the tool to replace one, so go ahead and buy or rent the right angle drill. Just remember that right angle drills deserve their reputation, and be prepared. Use this for things like installing screws in drawer guides in narrow cabinets, mounting upper corner cabinets, helping with vent-hood vent pipe installation (drilling a pilot hole in the cabinet top for the jig saw blade), etc. It also will fit in battery-powered drivers to drive screws at impossible angles. Simply outstanding - what can I say more? This is VERY WELL made tool and is an excellent add on to traditional drill driver. Saves a lot of time and hassle in tight spaces. This is very easy to use and again, very high quality. I have not used these types of tools before, but this has very small form factor and is very sturdy. i have this attached to my makita cordless impact driver and it works like a charm! i've used it to drive over a hundred sheet metal screws in steel framing one after another, all in a row and i was sure this thing was going to give out on me. but, i'm glad i was wrong because this attachment has proven itself to be quite reliable.